TOKYO — One of the most-watched and best-attended sporting events in the world took place in Tokyo last Sunday. More than 100,000 people, thousands of whom slept outside overnight, streamed into Tokyo Racecourse for the $5 million-plus Japan Cup. But as the Cup's 18 runners entered the walking ring just after three in the afternoon, you couldn't hear a thing but cameras clicking and birds chirping. The stone terraces circling the ring had been packed for hours, and rising above it, the six tiers of grandstand were jammed. Even the enclosed bridge connecting the train station to the racecourse was filled with onlookers. It stayed quiet as the horses turned one lap after another. Thirty minutes felt like three hours. These long post parades are unique to Japan, and they happen before every race. It's surely not designed for the horses, some of whom must struggle to remain calm the entire time. It's meant for the fans. There were homemade signs and banners hung around the ring—a regular sight at Japanese racecourses. Each horse in the race seemed to have some supporters: Uncoiled; Harp Star; One and Only: Challenging Spirit. (Challenging Spirit seemed to be a fan club of sorts, with signs backing multiple horses throughout the day's races.) Jockeys also had their own supporters' groups: Welcome to Japan, Ryan Moore; Yutaka Yoshida: Fortune favors the bold; The World's No. 1 jockey, Yutaka Take. Other signs were less specific, and occasionally more confusing: Forza; Carrot Club. Fans wore hats embossed with the names of great Japanese horses of years past, like Orfevre and Deep Impact. It had the feel of a supersized high-school pep rally. Oh, there was money in play, all right. Two out of every 10 dollars bet on horse racing around the world is bet in Japan, but the atmosphere had none of the rowdiness I associate with American tracks. Almost nobody spoke to one another; if they had to, they whispered. Nobody jostled one another for a better view. I'd never seen anything like it. The grooms, wearing dark black suits, led their charges around the ring. The favorite Gentildonna, seeking her record third straight Japan Cup win to add to her more than $17 million in career earnings, bobbed her bay head and wagged her tongue. Others moved more quietly. Just a Way, the top-rated horse in the world, moved compactly, like a solid tank. The Japanese horses looked more lean than muscled; Ivanhowe, the German import, dwarfed them. The riders of three-year-old filly Harp Star, the second choice, and the lanky, dark bay Epiphaneia, wore the green stripes of U Carrot Farm. Epiphaneia, sweating and nervous, tugged his groom along. His rider, 33-year-old Belgian Christophe Soumillon, whose career success has come mainly on the French circuit, looked on anxiously. Epiphaneia's trainer, Katsuhiko Sumii, appeared less nervous. He had won the three biggest prizes in the world—the Dubai World Cup, Melbourne Cup, and Japan Cup—not to mention major races in Hong Kong and America, the latter with Epiphaneia's dam, Cesario. So he knew the family. His only words to Soumillon, who had never ridden the four-year-old colt, were that Epiphaneia "was very keen and likely to pull hard." Soumillon's challenge was to keep him back. The talent was most certainly there, as was the stamina to finish strongly at the Cup's roughly mile-and-a-half. 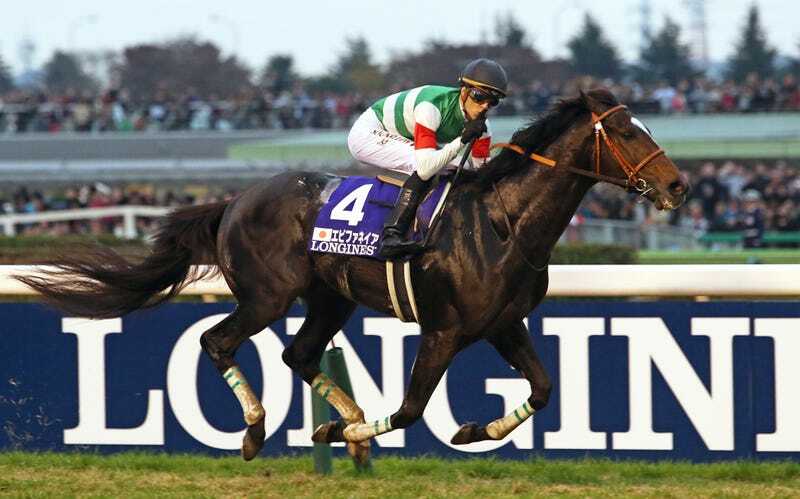 Epiphaneia had finished second in last year's Japanese Derby to a buzzsaw named Kizuna, the best of their crop, and he had won the nearly two-mile Japanese St. Leger, the final leg of the Japanese Triple Crown. He was fresh, too, with only three starts this season, whereas his serious rivals arrived at the ends of long campaigns. Harp Star and Just a Way had just returned from the Prix de l'Arc de Triomphe in Paris, and Gentildonna hadn't won since going to Dubai in March. Epiphaneia's freshness could go either way, however – he looked so keen to run that his trainer and jockey feared he might leave his race in the walking ring. Thirty minutes after the horses had entered the ring, a quiet voice called out "Tomare." Stop. The grooms froze, and the jockeys, standing in a row on the edge of the ring, bowed, and then marched to their horses. Two more laps followed. Then a voice from the back of the terraces broke the silence. Soumillon smiled broadly. He could walk the streets of Paris and go unrecognized. In Tokyo, he'd be mobbed. I had come, at the invitation and expense of the Japan Racing Association, to the 34th running of the Japan Cup, 2,400 meters on turf. It was created in 1981 to bring the world's best horses to Japan. Now Japan breeds the world's best. Domestic horses had won the last eight runnings of the race, and this year, only three foreign horses—all with outside chances—were willing to give it a go. Tokyo Racecourse, in quiet Fuchu 20 minutes by train west of Tokyo's center, is the largest, and, after seven years of renovation, the most modern of the Japan Racing Association's 10 courses. It's one of the great stadia of the world; its infield television screen was the world's largest until the Dallas Cowboys outdid it. It can hold up to 230,000 people, so, as strange as it sounds, it didn't even feel particularly crowded. The Kentucky Derby might get larger crowds, but its infield soaks up a large segment of that. I was one of more than 120,000 people in the grandstand at Belmont Park in 2004, when Smarty Jones's Triple Crown bid fell short. It took five hours to get out of the track, and I could barely move inside of it. Or get in a bet. People played beer pong in the backyard. I've also watched the running of the urinals in the Preakness infield and a bikini contest on a wet 40-degree day. Nobody paid attention to the races. At the last Wood Memorial I attended, at Aqueduct, I saw an old man hold a pen to another man's throat. Security told them to take it outside. There's no way I could've possibly explained those scenes to Japanese fans. Not watching the race? The thousands who camped outside the gates overnight didn't do so to get the best spot to set up their coolers, but to save a spot near the finish line or walking ring. It's tradition around here; in December 2006, 30,000 people slept overnight outside Nakayama Racecourse to watch the legendary Deep Impact's final career race in the Arima Kinen. Before this Japan Cup, it had been a long time since I thought of racing as a spectator sport. Outside of those big stakes races, and the stray meet like Saratoga or Keeneland, American grandstands are normally empty, dull, and depressing places. Even France, where racing is in good financial shape, most people have abandoned the courses to bet off-track. Here, gambling is important—six racing papers are published on weekends, and nearly everybody studied the form—but the banners, hats, and autograph seekers spoke to something else: a reverence for the horse and for the sport that hasn't existed in the West for decades. There were sights I'd never seen before at a racecourse. Single women studying the form and checking the odds. Groups of attractive women betting the races. Parents pushing baby strollers or watching their children at the indoor playground. Teenagers hanging out in the grandstand, eating sushi on top of their programs. Couples sitting together, searching for a winner. The old men who had probably been there when Tokyo Racecourse opened in 1933. It costs 200 yen to get in—not even two dollars. "It's not chicken and champagne," Murray Johnson, an Australian who calls the Japanese Group 1 races for international broadcast, told me. People drink Asahi in plastic cups and order soba noodles or sushi from row after row of stalls. Although large-scale betting syndicates operate in Japanese racing, the two-dollar—or 200 yen—bettors are its bread-and-butter. They fill the massive betting pools. Win and place wagers are not particularly popular; exacta and trifecta bets carry the day. "The Japanese like the idea of betting a small amount to win big," Johnson said. They do place win bets on big races so they can save the tickets as souvenirs—like when Deep Impact finished third at heavy odds of 1-2 in the 2006 Arc. It's why Gentildonna, who hasn't been the same horse since March, went off as a 7-2 favorite. I was also used to grandstand floors covered by a sea of losing tickets. There was at most a trickle here; most people waited until they found trash cans. And after disposing of their litter, if they wanted, they could wander to the reflection garden and waterfall in the racecourse's backyard—a place where they could mull their losses among autumnal colors of red, yellow, and orange. After the quiet of the walking ring came the static of nearly uninterrupted applause. From the eighth-floor press box, I could see rows of people 60-deep or more along the apron. Five minutes before post time, Frank Sinatra's "New York, New York" began playing and the infield video screen cut to a shot of Yankees ace Masahiro Tanaka waving from the owner's box. Two minutes before post, the horses began loading, and one round of applause followed another. A camera close-up of the great mare Gentildonna was greeted with a raucous ovation. Triumphal music played over the sound system. The starter climbed a tower and waved a red flag. Filip Minarik, the jockey on Ivanhowe, would say afterward that his horse was upset by the enormous crowd at the starting gate. "It was as if we were at a German Bundesliga football game," he said, "because there were so many people and everyone was shouting." They left the gate at 3:55, right on schedule, and the jockeys moved into position past the finish line for the first time. English jockey Ryan Moore put Gentildonna in a perfect spot along the rail. Two longshots, Satono Shuren and Tamamo Best Play, led the field, with Just a Way and Harp Star near Gentildonna in midpack. Soumillon, on Epiphaneia, looked like he was barely holding back his mount. They were in third, closer to the front than planned. Epiphaneia's trainer had instructed Soumillon to sit sixth or seventh. After getting on in the paddock, the jockey realized that wasn't going to be possible. "I thought I could maybe slow him down a bit in the turns, but couldn't," Soumillon said. Turning into the final straight, Epiphaneia was still cantering along, as the others were already pushing. Soumillon wanted to wait even more, but Epiphaneia's strides were getting longer. But he had expended so much energy tugging the whole race, and there were still 500 meters left. Soumillon sent him. They slipped between horses and were gone. Soumillon didn't even look back. He knew, and everyone could see, that the horses behind him weren't making up that ground. It wasn't even close; Epiphaneia won by four lengths. Just a Way, Spielberg, and Gentildonna closed tardily. The best international finisher was Germany's Ivanhowe, a respectable sixth. Canada's Up With the Birds finished 16th and the Godolphin-owned Trading Leather, the Irish Derby winner, pulled up before the final turn. It happened suddenly, which is almost always a bad sign. His jockey, Kevin Manning, tried to pull him up as quickly as he could, careful not to get in the way of other horses. Even from afar it looked like a fracture, and medical staff rushed to him immediately. Later that night, we learned he had been euthanized. Epiphaneia, his dark coat lathered, trotted back toward the stands, as a beaming Soumillon raised his arms. He threw his stick into the crowd, then his goggles. A stage was quickly assembled on the turf course for the trophy presentation. Soumillon got the loudest applause, followed by Masahiro Tanaka, who joined the winning connections on the podium. Northern Farm's Katsumi Yoshida, the owner and breeder, stood there calmly. He'd been through this before. Besides the winner, he bred and co-owns Gentildonna, Harp Star, Fenomeno, and Denim and Ruby. His horses ran first through third last year. I had talked to him earlier that day and asked if he preferred Gentildonna or Harp Star. Epiphaneia never came up. With his older brother Teruya, who had three runners in the Japan Cup, and younger brother Haruya, with one, the Yoshidas bred or owned nine of the 15 Japanese horses in the race. Katsumi and Teruya have alternated as leading breeder and owner for 25 years. Before them their father, Zenya, held the honor. It was Zenya who first put Japanese bloodlines on the map when he brought over 1989 Kentucky Derby winner Sunday Silence as a stallion, changing racing here forever. During the presentation, Soumillon thanked Katsumi Yoshida for giving him the ride. It had now been almost 30 minutes since Epiphaneia had seized the grandest prize in Japanese racing. A military band played "Land of Hope and Glory." The sun was setting behind Mount Fuji to the southwest, and thousands still waited at the rail, crying out for Soumillon's autograph or holding on for one last glimpse of Ephinaneia as he was led back to his barn. Ryan Goldberg is an award-winning freelance journalist and has been following horse racing since ducking security as a teenager to bet the races at Monmouth Park. He lives in Brooklyn and his past articles can be found at ryangoldberg.net. Top photo courtesy of the JRA.